The phrase ‘Hoxton restaurant’ has become a joke to many. Whatever it may once have meant, prosaically or otherwise, it has now become a byword for shallow, self-indulgent and self-absorbed trend-chasing. Although there may be an element of truth in this when looking only at the more obviously ridiculous eateries in Hoxton and Shoreditch, it’s an undeserved and lazily broad brushstroking for the most part. Given that Hoxton’s commercial rents are still reasonably affordable (for now at least) and its ready market of diners willing to try new and/or interesting cooking, rather than defaulting to a Nando’s, it should come as no surprise that the area is still home to intriguing restaurants such as the oddly-named Bad Sports. This small Mexican restaurant, sat in what was once almost certainly a takeaway premises, seems unremarkable at first with around two dozen covers and next-to-no decor. The small menu consisting of tacos and the occasional special, however, speaks louder than words. 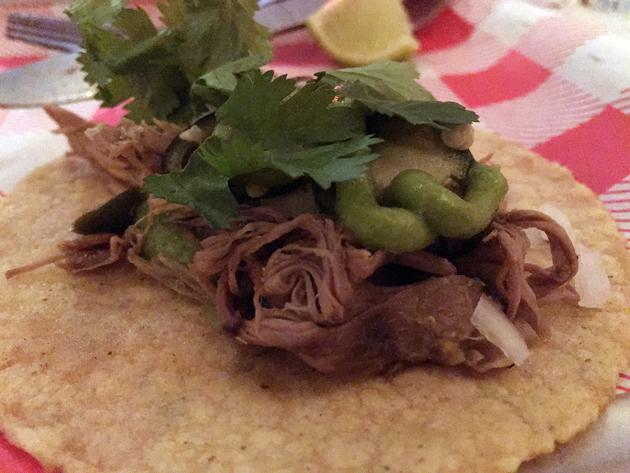 The most remarkable thing about Bad Sports’ tacos are the tortillas. This may sound like a small and almost inconsequential thing. But well-made, high-quality corn tortillas can make the difference between merely good tacos and really great tacos. The tortillas here were almost fluffy in their softness and pliable too. Yet they were sturdy, despite their thinness, and were also distinctly nutty. The taco fillings were variable in quality and never quite lived up to their superlative carbohydrate partner. Dilapidated sea bream was enlivened by an overly generous amount of salty seasoning and a neatly crisped skin. 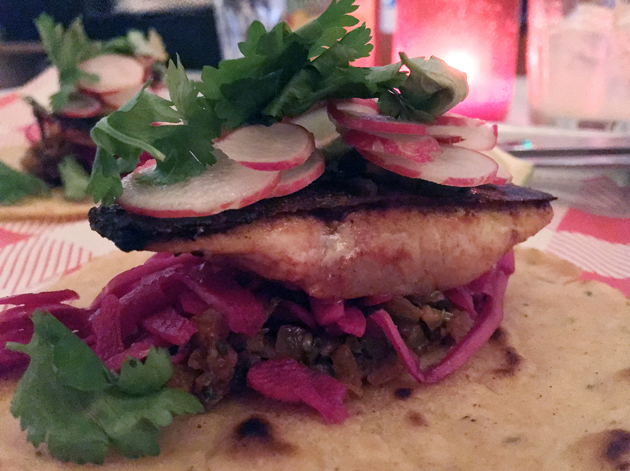 Firm radishes, a gently spiced salsa and some sweet and earthy pickles did the rest of the heavy lifting, helping to reel in these fish tacos from the maw of defeat. Today’s procrastination was brought to you, in part, by Foo Fighters. I was initially unconvinced by the big pyramidal segments of pineapple in the pork al pastor tacos, but they grew on me. Their sharp sweetness neatly offset the fatty moreishness of the pork. Although not the equal of the pork tacos I had the pleasure of eating in Oaxaca, they weren’t that far off either and easily outrank the vast majority of the other pork al pastor tacos you’ll find in London. Judge me by my looks, you do? 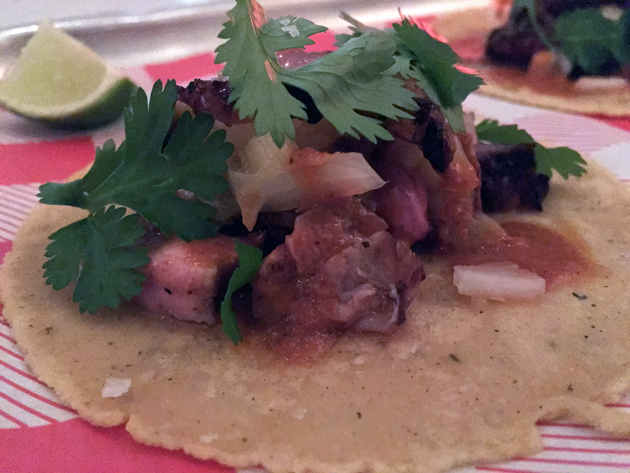 Tacos filled with lamb are only an occasional special and they’re worth nabbing if you have the chance. Moist, tender and lightly earthy meat came dressed in a sprightly, almost zesty sauce. 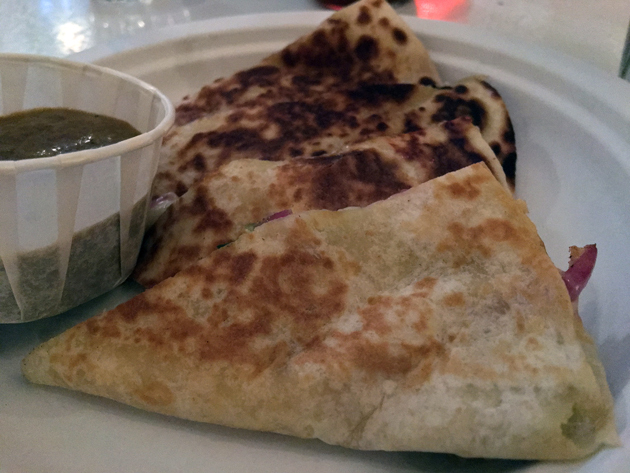 A pickled chilli quesadilla was almost pizza-like in its gooey decadence. Salty cheese, reminiscent of the Oaxacan variety, meshed well with tangy onions and sweet chillies that almost resembled bell-peppers. All of that was into thin, silky soft wheat tortillas. 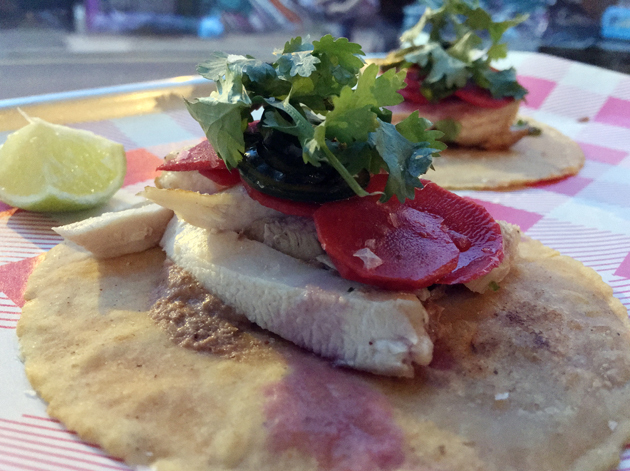 I’m still far more fond of tlayudas than I am of quesadillas, but that might not have been the case if all quesadillas were as good as this one. I developed a hankering for Oaxacan cheese while writing this. 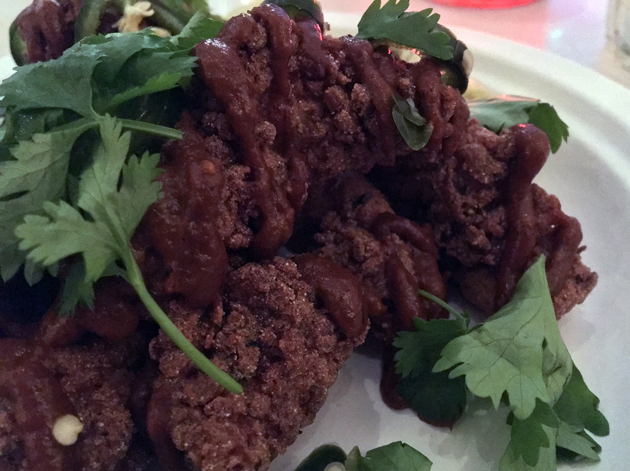 Chunks of fried chicken were unexpectedly good, although not because of the unsurprisingly shrug-worthy meat itself. It was all due to the batter-sauce double act. 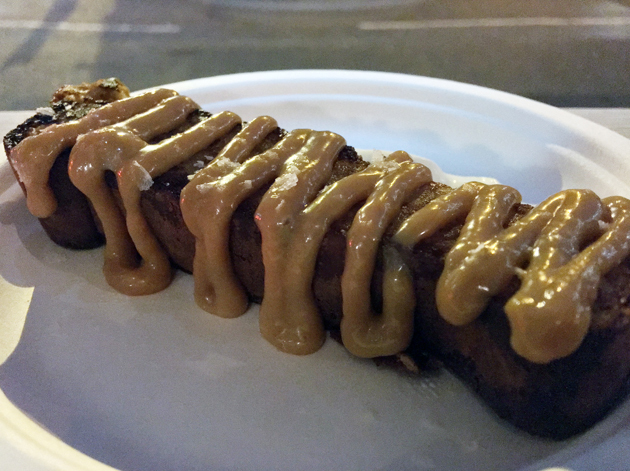 Supple, lightly crunchy and oil-free batter came sploshed with a nutty, almost chocolatey mole-style sauce laced with a mild citrusy heat. It was a sumptuously layered treat that deserves to be served and enjoyed more often. I’m used to corn bread as a savoury side, but Bad Sports uses it as the basis for a dessert instead. The fluffy, moist and modestly nutty corn bread resembled a well-made sponge cake, especially with its hint of muscovado-esque sugary sweetness. This latter quality was bolstered even further by a similar sweetness in the condensed milk which was almost like dulche de leche, but lighter and less viscous too. The cumulative richness of it all was neatly offset by airy sour cream. It won’t displace tres leches cake from my affections, but its soothing, coddling warmth still has much to recommend it. Some people think my captions are corny, but I don’t care. 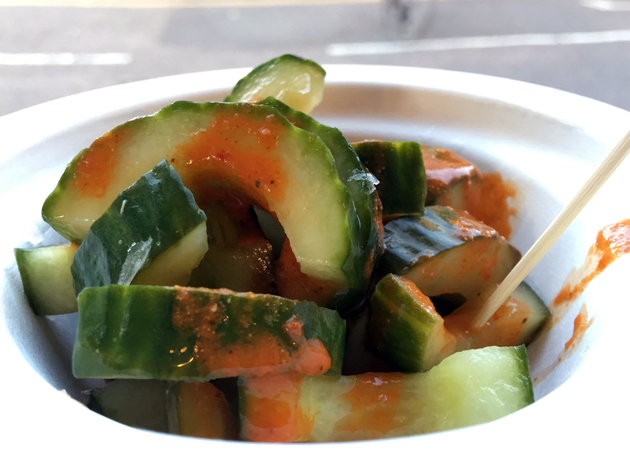 Modestly sharp pickled cucumbers would’ve been perfectly acceptable as a starter in their own right, but were even better when dressed in a chilli sauce tinged with a fruity heat. A cucumber that probably won’t scare the crap out of a cat. 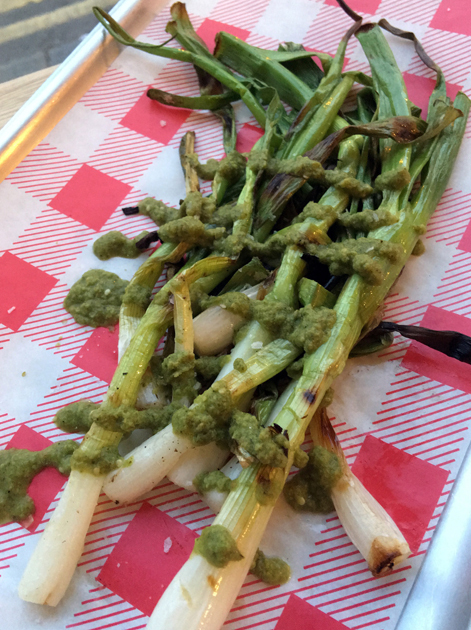 If you’re having the side of grilled spring onions, then it’s definitely worth asking for a steak knife. A standard table knife just wasn’t up to the job of cutting the chewy and fibrous vegetal strands into manageable portions. Even then, there weren’t an especially effective conveyor for the the fruity sweet sharpness of the vinaigrette, with the sauce sliding off the non-absorbent greens. Bad Sports uses paper plates, for whatever reason, with the exception of this spring onion dish which came on a metal tray. The same high quality tortillas from my first visit were once again present in all the tacos. Oyster mushrooms were a little too bitty for their texture to stand out, but this vegetarian option still had much to recommend it. Earthy, tangy, sweet and sharp – all that in a couple of thrilling, tongue-pleasing mouthfuls. The black colour of the tortilla made next to no difference as far I’m concerned. Crispy chicken wasn’t at all crispy, but that didn’t really matter. Moist thigh meat dressed in a nutty and umami sauce was effectively counterbalanced by sweet and sharp pickled carrots. Why did the chicken cross the road? To check out the menu at the branch of Morito on the other side. Slightly chewy strips of bavette steak had enough beefy tang to them to stand out against the backdrop of sharp parsley, onion and radishes as well as a zingy, zesty sauce. Cheeseburger tacos are an increasingly popular mash-up, which is no surprise. The minced beef had a relatively chunky grind, but overall it was an unmemorable lump of protein that had little to say for itself. Relatively creamy cheese along with sweet pickles and onions rounded out an underwhelming taco. 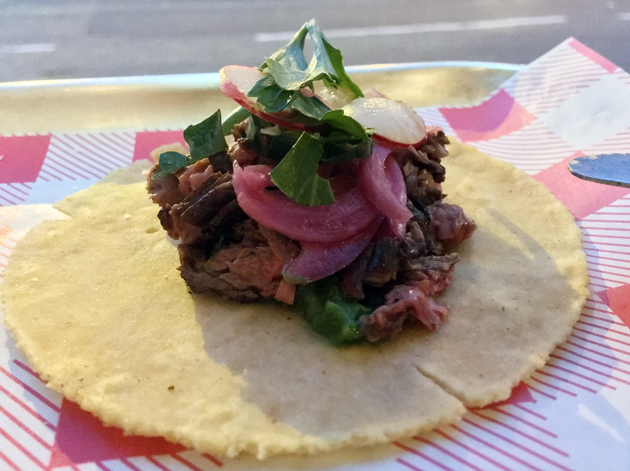 It didn’t come close to the acceptably good cheeseburger tacos at Killer Tomato, never mind the superlative ones at Temper Soho. There’s stool and counter seating by the window. 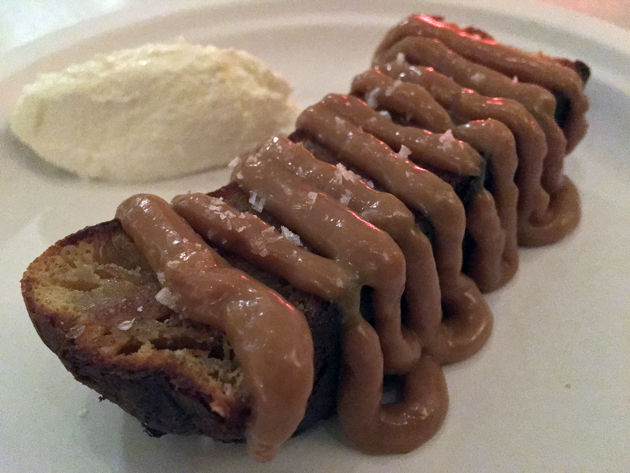 The cornbread dessert was much the same as it was before. Bad Sports should not be underestimated or dismissed out of hand – it’s certainly not just another Hoxton trend-chasing vanity project. 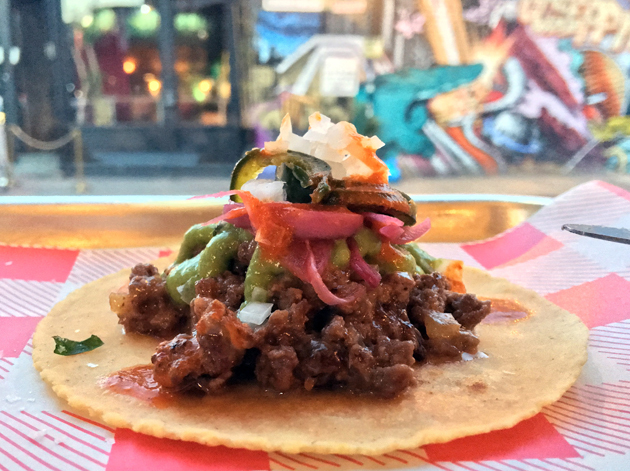 Although its cooking certainly isn’t perfect, Bad Sports still knocks out some crave-worthy tacos which are easily the equal or the superior of the tacos from many of London’s better-known and shinier Mexican restaurants. If you’re a fan of Mexican food, then it’s not a question of ‘if’ you should visit Bad Sports but merely a matter of ‘when’. 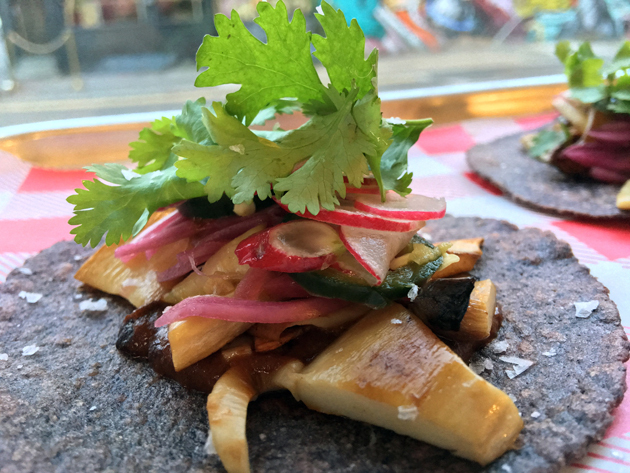 What to order: Mushroom tacos; Pork tacos; Steak tacos; The specials. What to skip: Possibly the sea bream tacos. Opening Hours: Tuesday-Thursday noon-15.00 and 18.00-22:30. Friday-Saturday noon-15.00 and 18.00-midnight. Sunday noon-22.00. Closed Monday. Average cost for one person including service and soft drinks: £30-40 approx. Tags: bad sports, cheeseburger, chicken, corn bread, cornbread, fried chicken, hoxton, lamb, london, mushrooms, pickles, pork, quesadilla, restaurant, review, sea bream, shoreditch, spring onion, steak, taco. Bookmark the permalink.